Millions of people travel along the Pennsylvania Turnpike through Bedford and Fulton Counties each year. However, few realize that just a few hundred yards away from them is one of the state’s oddest attractions: The Abandoned PA Turnpike. The Abandoned PA Turnpike was created by the rerouting of the highway in 1968. When it was originally built, the Pennsylvania Turnpike was a four-lane highway, but only had one-lane tunnels. Eventually, this created backups that had to be resolved. In many areas, larger tunnels were dug next to the existing tunnels. However, for a stretch of the turnpike in Bedford and Fulton Counties, the turnpike was rerouted. Instead of going through the mountains, it went over them. Looking out from Rays Hill Tunnel onto the Abandoned PA Turnpike. This rerouting created a 13-mile stretch of road that was no longer in use. 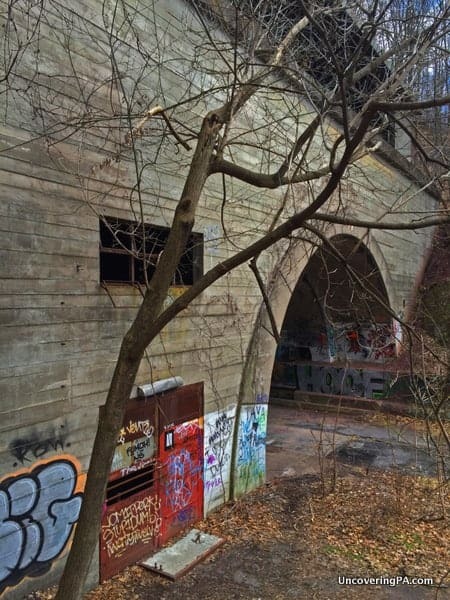 Over the years, this section of abandoned turnpike in Pennsylvania had a variety or uses, including turnpike worker training and military training exercises. It was even featured prominently in the 2009 movie, “The Road”, starring Viggo Mortensen because it looked so post-apocalyptic. The overgrowth leads to the post-apocalyptic feel of the Abandoned PA Turnpike. In 2001, this 13-mile stretch of abandoned PA Turnpike was given to Southern Alleghenies Conservancy by the Pennsylvania Turnpike Commission. Run by an organization called Pike2Bike, the ultimate goal is to turn the abandoned turnpike into an official biking and walking trail. The information sign at the entrance to the Abandoned PA Turnpike in Breezewood. Today however, nearly 15 years after the transfer, little has been done to make this a reality. 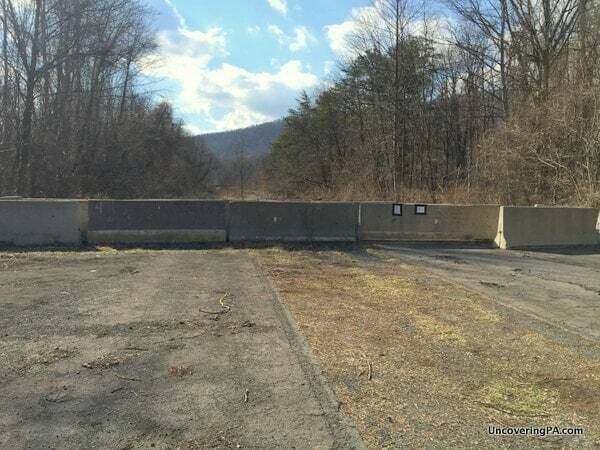 In fact, the Abandoned Pennsylvania Turnpike is officially closed to visitors, as signs at the entrance tell you. However, the language on the signs lets you know that it’s not a no trespassing area, simply an area where you proceed at your own risk. If you do opt to visit, use common sense and be respectful of the area, so that there is no reason to actually restrict access to the area. From the parking area in Breezewood, Pennsylvania, it’s 1.5 miles to Rays Hill tunnel. The hardest section of the hike is a steep hill right at the beginning. Once at the top, it’s a level walk or bike ride along the road all the way to the tunnel. What’s left of the Abandoned PA Turnpike in Bedford County, Pennsylvania. The road has concrete barriers in place near the beginning, wide enough for a bike or stroller, to prevent motorized vehicles from accessing the abandoned turnpike. While the rest of the road is relatively wheelchair friendly, I’m not sure if one could fit through the barriers. In many ways, the walk along the abandoned PA Turnpike to Rays Hill Tunnel reminded me of the abandoned Route 61 in Centralia, Pennsylvania. 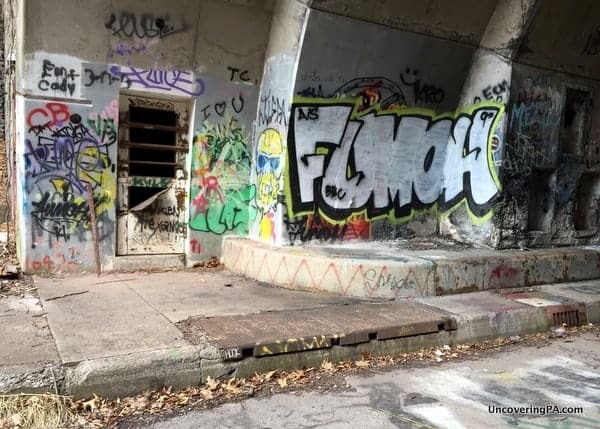 Fortunately, though, the abandoned turnpike has a surprising lack of graffiti on the road itself, and most of what’s there is relatively tame compared to Centralia’s Graffiti Highway. After about 30 minutes of walking, you’ll come to Rays Hill Tunnel, shortly after crossing the bridge over Mountain Chapel Road. The view of the tunnel from the turnpike is quite impressive, and it really does make you feel like you have survived some cataclysmic event that destroyed humanity. Rays Hill Tunnel near Breezewood. The tunnel itself is heavily covered in graffiti, which does take away some of the beauty. Fortunately, though, the graffiti is relatively tame, though there are still some areas that are not family friendly, especially the further inside the tunnel you go. Until a few years ago, it was possible to go inside Rays Hill Tunnel. Access is now blocked by large metal doors. However, it is possible to still see inside the first floor rooms, which feel very much like the set of a horror movie. The view of the interior of Rays Hill Tunnel as seen through the window in the metal door. Construction began on Rays Hill Tunnel in 1881 for its use as a railroad tunnel. 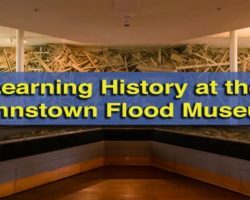 However, it was never used for that purpose and it was updated in 1938, opening to traffic along the Pennsylvania Turnpike in 1940. The tunnel is 3,532-feet long, making it the shortest of the original turnpike tunnels. A biker stands at the entrance to Ray’s Hill Tunnel. When walking up to the tunnel, you can actually see a sliver of light from the far end. This might make you think that it’s not that far away. However, once inside the tunnel, it seems like you walk forever and the far opening is still just as far away. I should note here that the interiors of the tunnels are very, very dark. While there is some ambient light from the entrance, it only lights up the first hundred yards or so. After that, you’ll definitely want to have a good flashlight or two with you. Along the way, notice the old sewer openings, the only real points of interest in the middle of the tunnels. Looking into Rays Hill Tunnel. The sliver of light you see is the end of the tunnel, over half a mile away. Once a few hundred yards into the tunnels, make sure to give a shout. 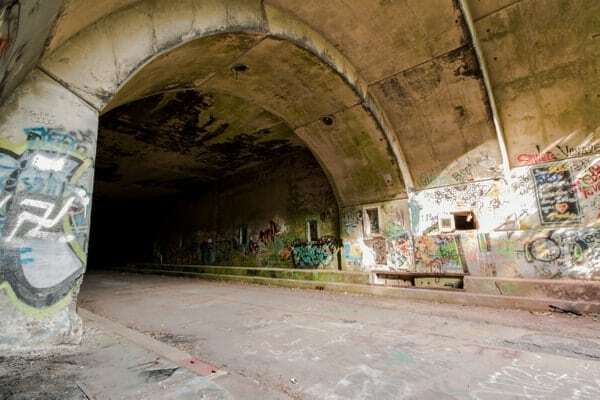 The echoes in the tunnels of the Abandoned Pennsylvania Turnpike are awesome! I couldn’t believe how long my voice echoed, as it made its way through the tunnel. Really, it’s worth visiting the tunnels just for the echoes. Near the entrance to Rays Hill Tunnel is a door through which you can see the inside of the tunnel’s rooms. Once you are done checking out Rays Hill Tunnel, you have two options if you want to visit Sideling Hill Tunnel. 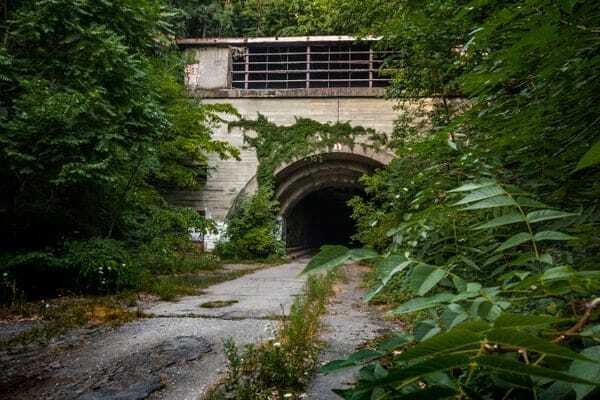 The first is to walk through Rays Hill Tunnel and continue walking along the abandoned turnpike for another 3.8 miles until you reach the other tunnel. Conversely, you can do what I did, and drive to the other end for a 1.2 mile walk to the tunnel. If you opt for this second route, walk the 1.5 miles back to your car in Breezewood, and drive 20 minutes to the other end of the abandoned turnpike. Unlike the parking area in Breezewood, this side of the abandoned turnpike is in a very rural area of Fulton County. Despite this end being located in the town of Waterfall, Pennsylvania, there don’t appear to be any nearby waterfalls. It’s pretty obvious that the 1.2 mile stretch of Abandoned PA turnpike between the parking area and Sideling Hill Tunnel is less frequented and less cared for than the section in Breezewood. The road here is a bit more overgrown, a bit more dilapidated, and there is a bit more trash. However, the walk along the abandoned turnpike is quite pleasant, even if it is uphill most of the way to the tunnel. The remains of the Pennsylvania Turnpike near Sideling Hill Tunnel. Along the way to Sideling Hill Tunnel, you’ll pass a long concrete area that used to be home to the Cove Valley Travel Plaza until the turnpike’s abandonment. While it’s interesting to see the open expanse, there’s nothing remaining of the plaza except a few manhole covers. The western end of Sideling Hill Tunnel is located just downhill from the current Pennsylvania Turnpike, with the tunnel running directly under the road. Like Rays Hill Tunnel, it was originally built in 1881 for trains, opened to vehicular traffic in 1940, and was bypassed in 1968. This tunnel’s more off-the-beaten-path setting means there isn’t as much graffiti here, and it was still possible to enter the ground level rooms on the tunnel’s western end, though entering any of the buildings is not recommended as they are very unsafe from what I’ve been told. Sideling Hill Tunnel along the Abandoned Pennsylvania Turnpike. At 6,800-feet long, Sideling Hill Tunnel is significantly longer than Rays Hill Tunnel. From inside the tunnel, it is nearly impossible to make out any light at the other end. Should you decide to venture in more than a hundred yards or so, use extreme caution and bring a couple of flashlights with you. Of course, you might decide to turn back, as the inside of these tunnels have a very, very creepy quality to them. 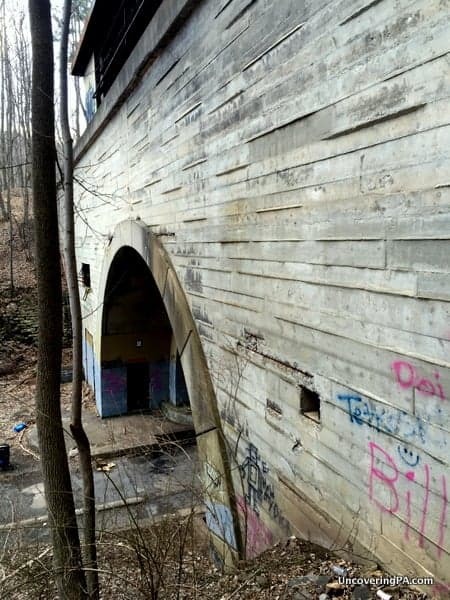 Overall, a visit to the Abandoned PA Turnpike is a fascinating look into history and one of the oddest places you’ll find in Pennsylvania. I definitely recommend taking the time to visit this amazing destination. But, if you need even more convincing, check out this really cool video I came across, and then scroll down for directions to the abandoned Pennsylvania turnpike. There are two primary access points for the Abandoned PA Turnpike. The first, is less than a mile from the center of Breezewood, at the intersection of Interstate 70 and the Pennsylvania Turnpike. To get there, head out of town going east, past the Quality Inn. As soon as you leave town, you’ll go down a big hill. 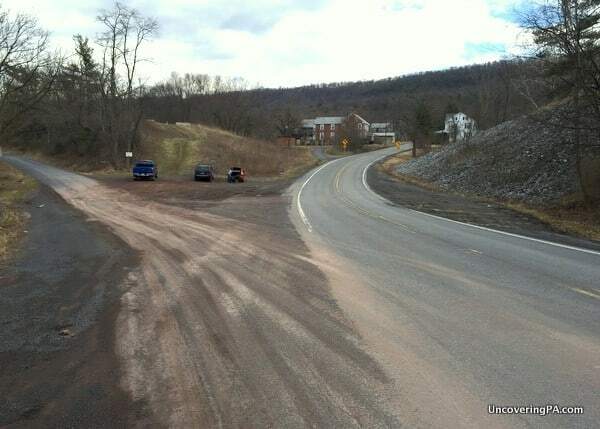 Here, Tannery Road will fork off to your left, while Route 30 continues to the right. In between, there is a large, triangular-shaped area. This is the parking area for Rays Hill Tunnel and the southern end of the Abandoned PA Turnpike. The coordinates for this parking area are: 39.999881, -78.228380. The parking area for the abandoned turnpike near Breezewood. After parking, head up the hill along the dirt path. At the top, you will see the abandoned turnpike. Many who visit ride their bikes along the roughly 8.5 miles of road between Breezewood and Waterfall, PA. (Note: There is not a waterfall in Waterfall, PA. Go figure.) This stretch of abandoned turnpike takes you through the two tunnels and along the old road in Bedford County and Fulton County. A side view of Sideling Hill Tunnel. However, if you are walking, I recommend not walking the 4.5 miles to Sideling Hill Tunnel from the western side of Rays Hill Tunnel. Instead, return to your car and drive 10 miles to the northwestern end of the road. From here, it’s only 1.2 miles to Sideling Hill Tunnel. Here, parking is on the abandoned turnpike itself, accessed via a short road. The road does seem a bit like a private drive, but about 100 yards up is a parking area and access to the path. The parking area is located at the following coordinates: 40.048683, -78.095839. To access this parking area, you do not take the marked road that says it is for emergency vehicles. Instead, you take another road that is about 100 yards further down the road. The parking area for the abandoned turnpike near Sideling Hill Tunnel in Fulton County, PA. 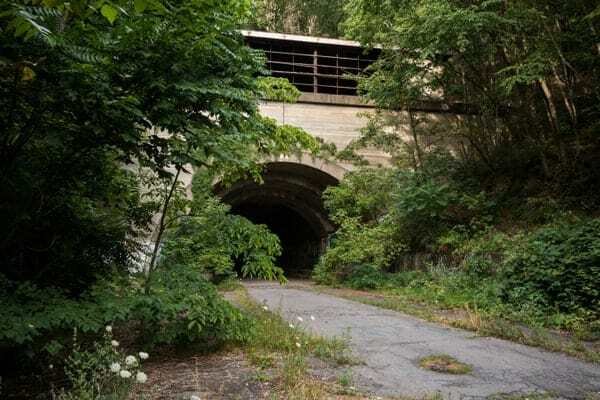 While both sections of the abandoned Pennsylvania Turnpike are worth visiting, if you only have time to visit one area, check out Rays Hill Tunnel in Breezewood. The walk is a few minutes longer, but this tunnel is easier to reach, the old roadway is in better shape, and the tunnel itself is cooler in my opinion. 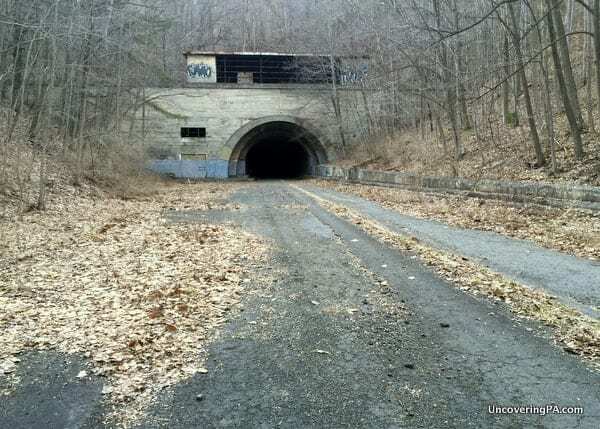 However, if you have the time, I highly recommend visiting both tunnels along the Abandoned PA Turnpike. The entrance to Ray’s Hill Tunnel. Find a great places to stay near Breezewood and the abandoned PA Turnpike on Booking.com (affiliate link). Holiday Inn Express – The area’s highest-rated hotel on Trip Advisor. 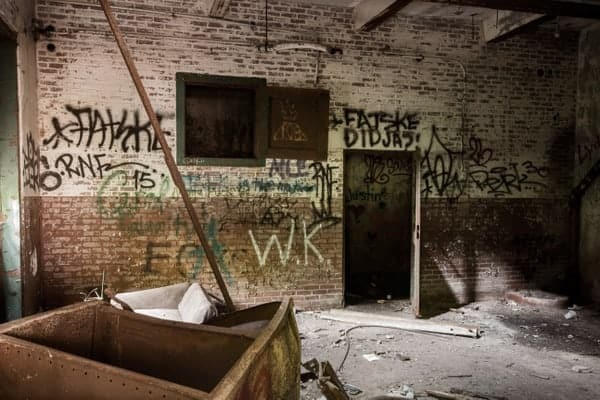 Interested in more abandoned places in Pennsylvania? Check out this Abandoned Trolley Graveyard. Interested in spending more time near the abandoned PA Turnpike? 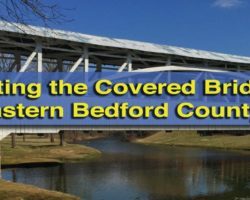 Visit East Bedford County Covered Bridges and Bedford County’s Gravity Hill. Jim, thanks for this very intriguing post. I drove along the Lincoln highway (in the dark) on my way to York county this past December; I think I was relatively close to this attraction? This lonely, long stretch of road, rich with history, really made a lasting impression on me. I just might have to go back and check this out! Yes, Carolyn, the first parking area for the abandoned turnpike, the one close to Breezewood, is right next to Route 30. Definitely stop the next time you are in the area and check it out. I have through Breezewood many times on the Turnpike but never knew about this. Next time I am up that way I will have to check it out. It’s definitely worth stopping to see. Hope you enjoy the trip, Larry! And then there’s the Laurel Hill Tunnel which is now owned by Chip Ganassi Racing and has been turned into a secret wind tunnel. Google it. I think you’ll be amazed! Thanks for sharing. I heard it was being used as a wind tunnel, but didn’t know anything about it. Very interesting read. The Laurel Hill Tunnel is not owned by Chip, it is leased by the Turnpike Commission. Hi Jim, great article. I have been here a few times and absolutely love the place. The more the public becomes aware about it the better chance the state has at securing funding to do some upgrades and repairs and get it turned into an actual bike trail destination. I am from Canada and it is well worth the 8hr drive to come see it! It is a special place, Kyle. I’m guessing by your link that you’re the one behind the drone video I included in the post. It’s really well done. Keep up the great work! The best way to visit the tunnels is on a bicycle. It’s a quick ride to experience both tunnels. Be sure to sing as you ride through the tunnels it sounds amazing. If you are going to explore other areas of the tunnels make sure you have more than one light. 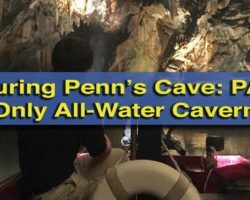 I was deep inside the longer tunnel’s passageways when the thought came to me “what if my flashlight bulb burned out?” There are stairways, places flooded with water (not sure how deep, I crossed on a plank someone had laid across. It would be extremely difficult to find your way back out without a light. The main passage through the tunnels (where the cars drove) is in excellent shape and no danger of getting lost just keep going and you will get through. I explored these tunnels one year at my wife’s suggestion because she thought the adventure I was planning on doing was too dangerous. Lol, if she only knew? Most of the interior areas have been closed off now, which probably is a smart idea. I can imagine someone could get lost for a very long time inside. I’ve been through the Sidling Hill tunnel a few times. The first time, several family members all walked through the tunnel. Nobody brought a flash light, which made it very fun! This tunnel, being so long, has a nice “dead zone” in the middle where you can’t see light from either end. I imagine it’s from the tunnel being dug from both ends to meet in the middle. There’s a slight curve where they apparently met, not to mention a little bit of an incline. These small variances give that center spot the dark spot that makes it so fun! I didn’t make it all the way through the tunnel, but I can imagine it was very dark in the middle of Sideling Hill Tunnel. It’s 1.25 miles long! 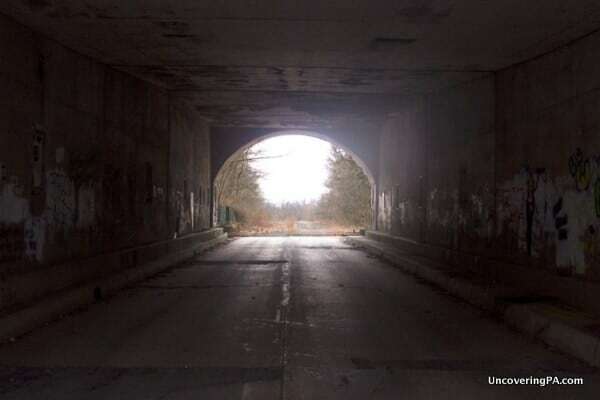 This totally looks like the inspiration for the tunnel you have to go through in the original “Left for Dead” game. Thanks for sharing! Never knew this was near Breezewood. I hope you have a great visit, James! I so wish there was a website like this for Maryland! Ugh so many places in PA I want to go, but so little time. There are a lot of great places to visit in Pennsylvania, Calvin! Glad you enjoy the site. Great write up and review Jim. I must admit to seeing some abandoned roads and tunnels but never thought much of them before. The history sounds fascinating and the path looks like a great day’s cycle. Like you say it is a shame about the graffiti. It is always a big turn off for me that people can be so disrespectful to property which is not theirs. The graffiti really is a shame, but it wasn’t nearly as bad as I was expecting. Much less than Centralia, another abandoned area in Pennsylvania. I would love to see someone organize a half-marathon run on this sight. As a avid runner, I would love to run this stretch of road from one end to the other. Being 13 miles, it would be a natural location with no traffic worries. Just may have to set up temporary lighting in the tunnels. 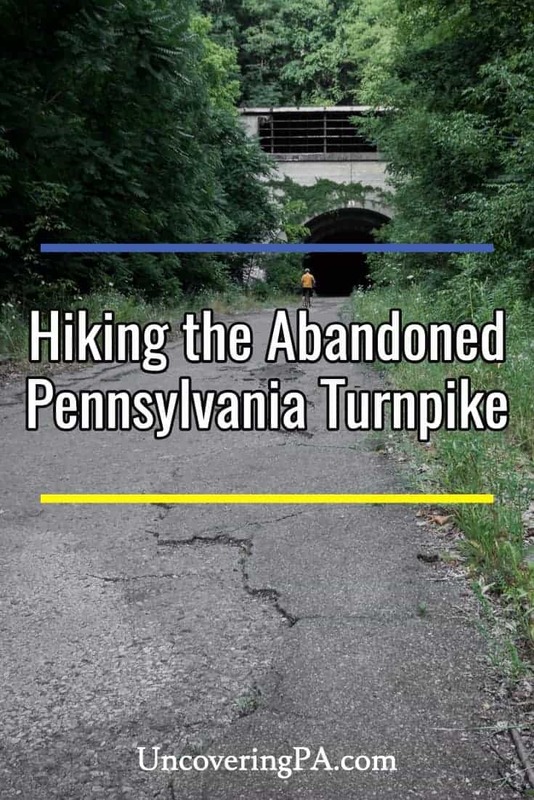 As an FYI – there is also another place where you can get on the abandoned turnpike just west of the Sideling HIll tunnel. Following US 30 east from Breezewood, go approx 3.5 miles and turn left on Valley-Hi road, then right on Oregon Road (this is a dirt road) a little over 2.5 miles where Oregon Road goes under the abandoned turnpike. There is a small parking area there, and a few steps leading up to the turnpike. Please take note that these steps are rather steep, however, from here it’s just under a mile to the western portal of the Sideling Hill tunnel. Looking west from this overpass of Oregon Road also gives a fantastic view of a long straightaway of the turnpike. Thanks for the information. I had heard that there was a center access point, but I didn’t have a chance to check it out on this trip. Hopefully next time! I’m a little confused. Is it possible to go through both tunnels? The way it read in one paragraph it sounded like the Rays Hill tunnel is now impassable due to large steel doors but then the author continued with his account of passing through that tunnel. Could someone please clarify? I would love to make the trek out there but would like to know what to expect. Thanks! 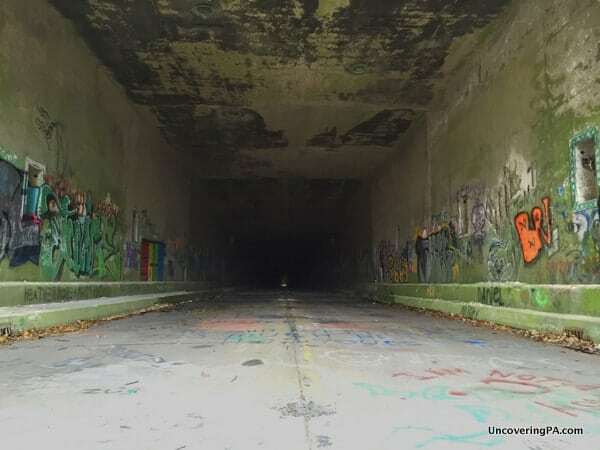 It is possible to go through both tunnels and walk or ride a bike from one end of the Abandoned PA Turnpike to the other. The part that is closed off is the control rooms and other interior rooms of the tunnels. The actual passages are passable, but bring a very strong light if you intend to go through them. Thank you! The bike is loaded up and I’m heading out soon! I’ve hiked the entire trail on foot in 2007, 2008, 2009, 2013, 2014, and 2015. A long hike which will give you feet a workout. Looking forward to learning more about travel in PA. Interesting story about the PA Pike! Never knew that before. Jim – Was up there a couple of weeks ago and the place is quite interesting. You should mention that you can access the turnpike in the middle by turning left out of Breezwood on Hwy 915, going under the actual Turnpike and then turn right on Oregon Road. Don’t remember how far down it was on the dirt road but there is a parking area on Oregon Road that is right next to the abandoned turnpike where you can come out on a very long section of 4 lane. Overall awesome excursion and glad I made the trek – probably walked more than 7 miles that day. Glad you enjoyed your trip, Gary, and thanks for including the information about the middle parking area. I was aware of it, but since I didn’t check it out, I simply didn’t know directions or coordinates. Because of that, and the easy access from either end of the roadway, I didn’t include that area. Hopefully, I can park there the next time I’m in the area. Love this kinda stuff thanks man! So very awdome! Did u use a halicoptor? And so crazy these “taggers” tag/graffiti places others have not a clue about!? The video isn’t mine, but one I found on Youtube and thought was worth sharing. However, the video was shot with a drone. I’d love to get one of my own some day! Is the trail safe to ride a bicycle by yourself? I really want to ride this but not sure I can convince anyone to make the few hour drive with me. Went up on Sunday and, like you said, too many horror movies makes the tunnels pretty creeptastic when you’re alone, albeit, it was so dang hot outside the tunnels were quite refreshing. I’ll take the willies over the heat and humidity any day! Can’t argue with you on that, Terrence! Glad you enjoyed your visit. I am looking to do this as a day hike straight through and have found many different accounts on how far the distance is. I’ve seen from 7.5 all the way to 13 miles from one end to the other. My plan is to part a car at the entrance of one tunnel and another at the other end. Is this a good day hike or is it too long. Kyle is correct. It’s around 7.5-8 miles from one end to the other (Though it’s closer to a mile to Sideling Hill. I measured it). The 13 mile listing probably includes some of the closed off parts of the Turnpike. If you plan to walk all the way through the tunnels, make sure to take a couple of very good light sources as it’s pitch black in the middle. Why were these sections of the PA Turnpike abandoned and rerouted? When it first opened all of the turnpike tunnels were one way. Meaning, they had to stop traffic to let one direction through, and then switch. This created a ton of backups. That’s why there are two tunnels instead of one big one at most of the PA Turnpike’s tunnels. At this section, it was deemed easier to reroute the Pennsylvania Turnpike along the mountainside, and they’ve been abandoned ever since. I have quite a few photos taken when a friend and I biked the full run of this a few years ago. I’d be glad to post them if someon wants to tell me how. What is the music called? Are you referring to the music in the video? If so, I didn’t make the video. It was just one I found on YouTube and thought was good. You might want to comment on the video there to find out. The graffiti didn’t take anything away. In fact, it added to it. It adds to the history. Who wrote it? When did they do it? What caused them to want to do it? It’s one of the reason I love graffiti. Sure, some of it is bad. Nothing and no one is perfect. But a lot of it is beautiful in its own right. Can a motorized scooter get thru the entrance ! There are gates set up to make sure that nothing bigger than a bicycle gets through. It’s also worth noting that motorized vehicles aren’t allowed on the road, even if you can get it through. My boyfriend and I are thinking of doing this hike next weekend. Does anyone know if there is a water source anywhere? Also we may end up camping out? I’m assuming we won’t have trouble finding a flat spot?? Any insight would be much appreciated. Water sources? No, bring water unless you don’t mind refilling bottles from the mountain water. Yes, no water sources along the trail. It’s worth noting that while you won’t have a problem finding somewhere to camp, it is technically against the rules as far as I know. Shannon, I’m probably not much help here as I only do day hiking. Hopefully someone else can provide some good information. Made it to the Tunnels and Centralia for girls weekend this past weekend – with your guidance! Thank you for this site – it was incredibly helpful! We had a blast! That’s great to hear, Jessica! I’m so glad you had a good time. 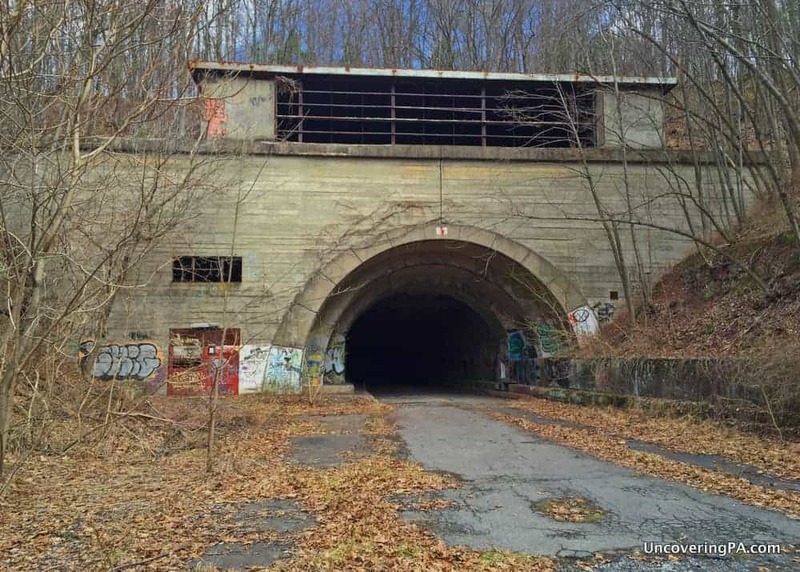 beginning in 1960 for several years we traveled the turnpike from the exit that take one up to Johnstown east to NY and went thru these tunnels many times. Thanks for the article, I found it to be very interesting. Would it be the much fun to ride? Seem to me that the flatness of it would make it a bit boring. To be honest, though, I think it’s better with just pedestrians and bikes. Might be a little loud in the tunnels with motorized vehicles. Motorized vehicles are *prohibited*. So whether they are loud or not is irrelevant. That it is prohibited now is irrelevant when talking about ideas for the *future* IMO of course. Other than vehicles to maintain the trail, or sanctioned vehicles for car tours , such as when we brought the COO of the Turnpike Commission to see the trial, motorized vehicles are prohibited. That is not just our rule, it is written into the original contract with the PA Turnpike Commission. I have the combination to our gates, the PA State Forrest has keys to their gates. They patrol and I maintain, other than that any other vehicle (ATV can get in but cars are almost impossible) is breaking the law. Is a trail that takes you to a time and place that have never existed boring? You tell me. Post Apocalyptic America, where for the entire ride there is no sign of modern life, and two tunnels, dark for 48 years, not exciting? The Sidling Hill Tunnel is 1 1/3 miles long and it rises 30′ in the middle for drainage so you can’t see from one end to the other. Do you want to go through? You don’t know what is in there. We give tours and show the places locked off from the public, and the hidden gems. If this isn’t the most fascinating and exciting ride you have ever done, you can have your money back. Of course you can do it on your own and it will be wonderful but you won’t know how or why. Murray Schrotenboer Chairman of the Pike2Bike. Is it safe going through the tunnels? I would say yes, but that’s up to your comfort level. I definitely wouldn’t go through without a flashlight or two, and I personally wouldn’t go through by myself. Never heard of any issues there. Can you ride your horse along that trail? It only says that motorized vehicles aren’t permitted, so I would assume it’s okay, but I honestly don’t know for sure. Keep in mind that the entire route is along an abandoned roadway. There aren’t any dirt trails. Motorized vehicles are *not* permitted. They are *prohibited*. I have traveled through that tunnel before they closed it and built the new Tunnel. Looks a lot like this one…. I am the Chairman and Manager of the Pike 2 Bike trail. The signs and welding would be my work. It is great to see the interest in the trail and much is happening at this point to move the trail forward. With luck by fall it will have been transferred to a Recreational Authority so that we can obtain the grants needed to make the trail into attraction it should be. is there any way at all to get more information about the entrance? I’m in a powered wheelchair and would love to travel this with a few of my friends. How steep is the hill? Are there any measurements on how much room there is between the concrete barriers? The hills are not very steep, especially going to Ray’s Hill Tunnel. However, the concrete barriers were barely wide enough for me to push a baby stroller through. My guess is that a wheelchair would not fit, but I don’t have specific measurements, just my best guess. The Jersey barriers were set so that you can ride a bike through but too close for an ATV. The barriers are about 200 yards from the very start of the trail just off Rt. 30 at Tannary Rd. Getting up to the top of the hill would be a much bigger problem. Until we can put in an access road and use the 1st 200 yards as a parking lot as it was intended, it will be difficult to get your wheel chair up the 30 %+ hill. We would recommend that you go to the Fulton Trail head on Pump station Rd. and park on the end of the trial there. Getting through the barriers is no problem and it is essentially flat to the Sidling Hill Tunnel, the distance would be about the same at close to a mile. Thanks for the extra information, Murray. I completely forgot about that initial hill when I replied. You would be hard pressed to get a wheel chair up the entrance at Breezewood and it is another mile on broken pavement to the 1st tunnel. A better option would be to go to the far entrance off Pump Station Rd. You can see it on our maps. Here you can wheel for about 3/4 mile to the Sidling Hill Tunnel. You don’t have any grade and the barriers are plenty far apart for your chair. I grew up in Fulton County PA and my bus Went past the one entrance of the tunnel every day so growing up i didn’t think much of them. I went there a few times as a teen we could just bike there from our farm and we knew the people that owned the land leading down to the one entrance (which from what i read is the back entrance because it was the farthest away from Breezwood) I myself have never been through the tunnels they were just too dark for me and i have not been back since 2000 when i was 16. If you want to know what the tunnels look like and the history behind them contact us at Grouseland Tours, the official tour leaders on the Pike 2 Bike. Are you able to use an ATV to the tunnels? No. Motorized vehicles are not allowed on the abandoned turnpike. There are barriers to keep them out at either end. Our original contract with the Turnpike Commission prohibits motorized vehicles. It is one of our biggest problems. I would be interested in any other abandoned roads or sites you know about in the PA, WV, MD and VA radius. I am a photographer and I am doing a series on abandoned areas in my area. After reading a couple other articles about the tunnels, theres one thing I haven’t been able to find an answer to. Is camping prohibited? No, camping is not permitted there. Camping is prohibited. The trail’s contract from the Turnpike Commission is for bike travel and not for camping. There are also liability issues. There are a number of camp sites in Bedford County. For someone who spent a lot of time as a child, in the back of my parent’s station wagon, traveling the turnpike, this is very interesting, bringing back lots of memories of “turnpike stories”. Like the time my Mom was pulled over by a state cop who thought she was drunk, or falling asleep at the wheel, because she was trying to drive and twist around to smack some unruly kids at the same time. Or the time a young fellow waved me down to the shoulder in a real panic because he thought his friend had fallen off the back of his motorcycle. Before the days of cell phones, he followed me to the next plaza where I called the PSP for him. Turned out he had pulled out of the last plaza before his friend could mount the bike, leaving him standing there. I had never heard of this trail until, ironically, just last night, my wife told me a friend at work had visited. So in fact, the real reason for this lengthy post, is to pass on, in third hand, that some sections of the trail are littered with sharp trash that can puncture bicycle tires. Out of this friend’s group of seven, two had punctured tires. Highly advisable to come prepared for repairs. That’s good to know about trash. I haven’t ridden a bike there, but it’s a shame that people litter and make it more dangerous and less enjoyable for the rest. I cleaned the tunnels only 2 weeks ago, brooming out the entrances. The signs we post say that bottles are prohibited, but the people who break bottles don’t care what we want. I will be going to the trail on Monday, Channel 11 out of Pittsburgh is doing some filming there and I need to do some welding on the Rays Hill door. I’ll do what I can to clean then. Thanks for all your work, Murray. It’s a shame that people can be respectful and enjoy their time when visiting the abandoned PA Turnpike. As a true fan of the Pennsylvania Turnpike, I discovered the abandoned section in 1973 while I was still in college. Over the years I have visited the site, and it, as well as the entire turnpike, and is documented in Images of America: The Pennsylvania Turnpike, written by Mitchell Dakelman and Neal Schorr. Published in 2004 by Arcadia, the book was so popular, that Arcadia convinced us to write a second book, which will be called The Glory Years of the Pennsylvania Turnpike and should be available later in 2016. Yes, Sideling and Rays will be in the book, plus many newly discovered and unpublished pictures. Mitchell, we hope that your book contains up to date information on the Trail. Many people stumble on it and don’t know that it is a maintained trail and in the process of becoming a true and open trail. The book Weird PA has a lot of misinformation. Our trail was featured in the State Museum of PA’s display for the 75th anniversary of the opening of the Turnpike. We supplied missing pieces for their toll booth and they created a display about us. You can see up to date information at our Facebook page Pike 2 Bike. As the Chairman and manager of the trail I can give you further information if you wish. I have tried to find more detailed information Was there a WW 2 POW camp by Sideling Hill Tunnel? That would be the CCC camp on Oregon Rd. You can access it from the trail either by getting off the trail at the Oregon bridge on the North side and taking the road 1/4 mile north, or 1/4 mile west of the west end of the Sidling hill tunnel is a service road to the north, 1/4 mile down this road is the Director’s cabin, now leased to a group of hunters. The CCC camp and later POW camp would be on the west side of Oregon Rd, and is no longer there. Roger, I have no knowledge of a POW camp near Sideling Hill Tunnel, but just east of the tunnel and along Oregon Road which passes under the closed Turnpike in Buchanan Forest, was the site of an old camp site. Regarding Murray\’s question if we have information about the road/bike/trail in the book that Neal and I are publishing through Arcadia Press, I don\’t recall if we had anything on it, but we do indeed have pictures of the Sideling Hill Tunnel sparkling and brand new in 1940. I live in AZ, but am originally from eastern PA. I made many road-trips from the Harrisburg toll entry booth to the exit which enabled us to find our way to Exit 41, Belle/Vernon/ to Monessen, my mom’s hometown. As recently as 2010 my DH and I traveled the “present” turnpike on a drive from AZ to PA, and I missed seeing the Sideling and Ray’s Hill tunnels. I thought I had lost it! Indeed, I was thinking in terms of a 50+ years trip taken about 1957. My 2010 trip was “strange,” since I navigated by landmarks and those tunnels were indeed that. Bottom line, I never even knew of the abandonment of that section of the turnpike because I wasn’t in PA for too many years. I found your informational site on Pinterest and say thanks for allowing me to realize what I had missed and that it wasn’t a part of my mind. Wish I could visit those tunnels, but not now; not now! In September 2016 we will be repeating our 2010 trip from AZ to PA, and then back to AZ. An adventure for one septuagenarian and one octogenarian. Wish us luck! I never had the chance to drive any of the mainline 2 lanes on the Turnpike since most of our vacations took our family to New England. 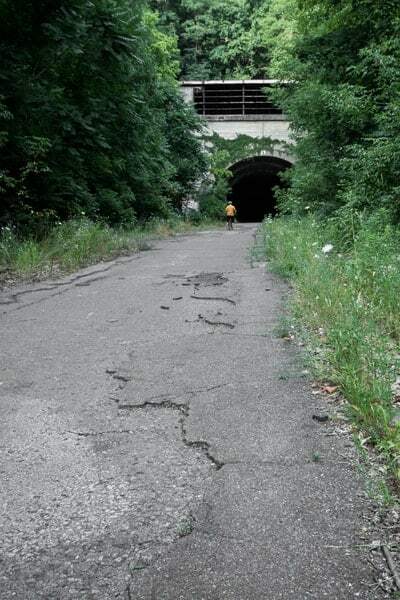 I discovered the Rays and Sideling Tunnels in 1973 and would go out there annually. It was a lonely forgotten place until the internet came about. That old highway and tunnels have so many recreational opportunities such as the hypothetical “Pennsylvania Turnpike Tunnel Road Race.” I do have many pictures of tunnels how they appeared from South Penn structures to today, and some will be published in a book coming out Dec 5. Mitchell, you may want to contact us about the book. We can provide you with the latest information, and photos regarding the Pike 2 Bike. I assume you are aware of the work Russell Love has done on the SPRR and his two DVDs. Plan to come to Sideling Hill Tunnel at the end of July. I recall riding through Sideling Hill Tunnel on our trips to Pittsburgh from Allentown as a kid. Years later, I kept looking to remember all the tunnel names and couldn’t figure out which was missing from the trip. I didn’t realize Sideling had been abandoned. I do remember the traffic back ups going to one lane to go through the tunnel and how scary it was with the cars coming towards us so close. It was before they build the 2nd tunnel at Blue Mountain, so all of them were one lane each way, and there were only little yellowish lights at intervals on the dark concrete walls. It’s very different with 2 lanes, tiled walls and lighting. Is it possible to ride a street bike on this trail or is it better for a mountain bike? The entire path is paved, but it can be rough in places. A street bike might be okay, but you’d have to be a bit careful. This is my happy place. I love love love walking and taking pictures there. Definitely worth seeing. Trees growing up and around guardrails, weeds peeking up though the cracked roads… nature is an awesome thing! I am usually there every other weekend for a morning walk in the summer. I did the bike tour a few years ago with friends. The guys who do the PIKE TO BIKE tour do an amazing job, you get a history lesson and see parts of the tunnels you had no idea were there. There were 6 of us, 2 had our own bikes, but the guys who do the tour have rental bikes also, and they provide everyone with lanterns. It’s a great ride. Linda, we enjoyed having you and your group for a tour. We agree, it is the best way to see and understand everything. Linda, The old Turnpike is a fascinating facility which I discovered in 1973, only 5 years after the new bypass closed. Over the years I have collected many pictures of that section of the Turnpike when it was still in service and can be seen in two Turnpike books I coauthored with Neal Schorr, the recent is The Glory Years of the Pennsylvania Turnpike. Wow..I am really behind the times. I didn’t even know the tunnels were abandoned. As a child (many moons ago) we would travel to and from York County and always went through the tunnels. It is kind of sad, but I am happy that they are being used for recreational purposes. The Turnpike was built with initially with 7, sone bore, two lane tunnels. There were always the plan to double tunnel them but economics and expansion of the Turnpike prevented all of this. By 1951 traffic backups were common at the Laurel Hill Tunnel, on the west end of the original turnpike. Studies were made and finally the plan was to build 4 new tunnels at 4 sites, and replace Laurel Hill with a bypass in 1964, and the rays/sideling, which were 3.8 miles apart, in 1968. The Lehigh Tunnel, on the Northeast Extension was double tunneled circa 1990. 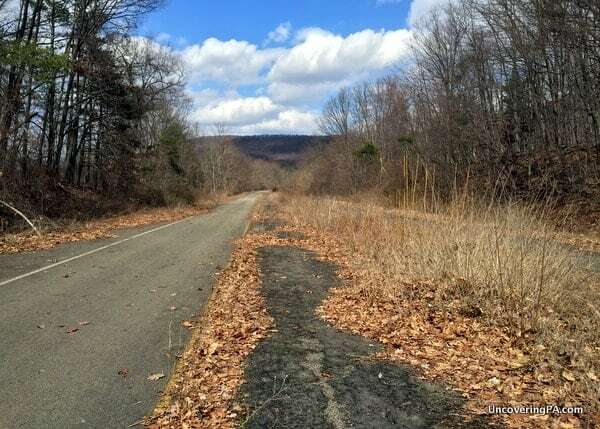 For many years the abandoned turnpike between Breezewood and Fulton County was stull the property of the PTC and was considered trespassing if you went on it. There were time I understand that state troopers would patrol it and issue trespassing tickets to explorers. But at the same time the tunnels were also vandalized. This is from the Pike 2 Bike web site, and explains how the trail came to be in the late 90s. While scouting the nearby BicyclePA Route-S, Joe Stafford was hoping to avoid the traditional challenges of Sidling Hill on Rt. 30, but was unable to find a reasonable alternative on existing roads. Western Pennsylvania trail guru Bill Metzger who was also at that meeting and who is a railroad history buff responded, “They are already there.” Noting that the abandoned Turnpike bypassed this mountain pass with a flat easy road section, a task force including PennDOT and the Turnpike Commission explored this new opportunity for re-use. 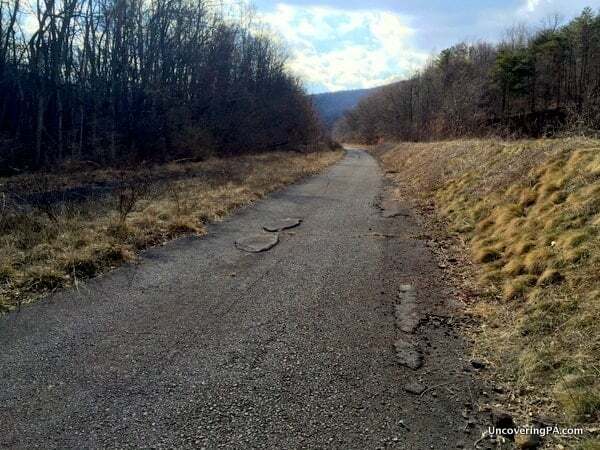 The Turnpike Commission was looking to dispose of the liability and it was eventually agreed that The Southern Alleghenies Conservancy (SAC) would purchase the land with intentions to have another entity manage the trail. On November 2001 with TV cameras and dignitaries watching, the Turnpike Commission handed over the trail for $1. Murray, how is funding coming along? I spoke with Carl Defebo some time ago and that was the issue. It would be nice to repair the joints, every 77 feet, and then repave one side of the Turnpike. The tunnels were never repaved. I still have that lengthy report that the late John Bibber furnished me. Also, repair spalling concrete at the tunnels and put back the steel letters that spell out the names, and do some detreeing at the tunnel sites. Last year the Bedford Co. commissioners put together a steering committee to look into an update on the 2005 Gannett Flemming study that said fixing the tunnels, paving (or just grinding down to the original 10″ of concrete), putting in trail heads, lighting the tunnels etc. would run about $4 million. The committee looked at all of the issues and last month chose Navarro & Wright to produce a new study. The estimate would be about 5 million. The $80,000 to pay for the study comes from a fracking tax that goes to each county and can only be used for recreational purposes. The county is now looking to assemble an authority comprised with people from both Bedford and Fulton Co. to buy the trail from SAC. The $5 million will come from state or federal grants for recreational trails. 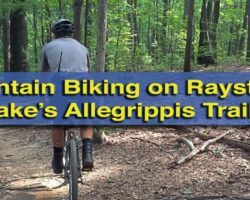 DCNR has been excited by this trail since 2000 when I took the head of the agency for a bike tour. Last fall Cindy Dunn the current DCNR Secretary along with Leslie Richards Transportation Secretary went for a bike tour and I took them up into the upper portions of the tunnels. There is a great deal of excitement to move the trail forward. SAC is out of money and needs to take the liability of the trail off its books. The counties are reluctant to take on the liability, despite the tremendous business opportunities that developing the trail will open. If I can be of any help, please let me know. I have many color and black and white photos of this section of highway which would be great for a brochure or promotions, or kiasks with interpretive message boards. Also, the famous shot with Carnegie at Rays Hill during 1885 SP construction. I see that you have numerous photos in the “Memories of the Turnpike” book that I picked up at the State Museum of PA’s Grand Opening of the 75th anniversary display. The Museum was missing a few pieces of their toll booth and during a tour with the Turnpike officers I mentioned that I was in possession of several toll booths worth of parts. The museum curator came to our place, looked over the parts and pulled out 4 or 5. In exchange I was invited to the Gala, and they put up a display regarding the P2B including a photo of which I was credited. 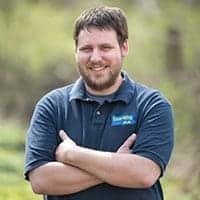 I’ve met with Carl several time, the latest, this time last year when a Pittsburgh TV station did an article about the Turnpike and the abandoned section. Carl stood in front of the Sideling Hill tunnel to talk about it. I pointed out that our contract with the Turnpike Commission gave us all of the land above the tunnel and did not exempt the live Turnpike that crosses over it. I suggested we put in a toll booth to fund the project. Carl said, “No, don’t bother, just put in a pinger to pull money from the EZ pass, people won’t even notice”. It sounded like a good idea to me. So does bedford county own part of the tunnels now? Murray would know that. The entire Sideling Hill Tunnel is located in Fulton County. The Bedford and Fulton county line is in the halfway point of Rays Hill Tunnel. The video isn’t mine. The best thing to do is to click on it so that it’ll send you to the video on YouTube, and then ask in the comments section there. Sure is a shame they don’t want to have an ATV club for those trails. We ATV riders pay a registration fee and carry insurance. ATV riders share our trails with hikers, bikers, and horses all the time with no problems. Seems like such a waste as the ATV clubs do so much for trail maintenance and clean up of trails. SSRT and Central mountain ATV club sure do a lot of good. Pa should take a lesson from Hatfield and McCoy and bring some revenue to the state. Many of us Americans are older now and our ATV and SXS allow us to enjoy and explore the great outdoors. Seems a bit selfish to me, when this could be connected with an existing state ATV trail. Honestly, I’m glad ATVs aren’t allowed on the trail. I’m sure that many riders are responsible, and it’s the responsible ones (not the irresponsible ones) that these rules keep away. However, I can’t imagine how noisy it would be in those tunnels if ATVs could go through them. Plus, allowing motorized vehicles on there would make it less safe for the bikers and walkers that use the trails regularly. I honestly can’t think of any trails that has frequent ATVs that hikers can feel comfortable walking on. Back in the early 70’s, I was an automotive test driver. I don’t know if it was on the up and up, but we met someone that gave us the keys to get in at the Breezewood entrance. I forget which stretch was the longest, but I do remember going through at least one of the tunnels to get to the stretch we were going to test on. We manufactured brake lining for Ford. We were running system system failures..fronts only, then rears, etc. at up to 80 MPH. Running a rears only at 80, we had a lockup and the car came around and took out two guardrails. We didn’t get hurt, but all I could think of was if we had been hurt, how long would it take for someone to find the bodies ! I wish I had brought a camera with me, as there is such a difference between what it looked like then and the great pictures you have posted. Great article ! This looks fascinating. My birthday is coming up and that is what I am choosing to do with my husband. Visited this place and Gravity Hill because of this blog. Thanks for sharing the great information! 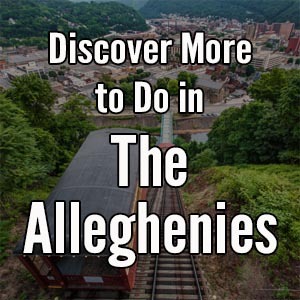 Glad I stumbled across your blog on a PennLive ad – we just moved to H’burg from Maine and are looking forward to exploring. Your blog is chock full of great ideas – I just can’t decide which to do first! Come-on weekend, I’ve got places to go now! This looks like it might be quite a fun day hike to go see, or possibly an overnight hike. ARe you able to hike the full length of the turnpike through both tunnels? You can start at Route 30, Breezewood, and walk east on the old Turnpike. You can pass through both the Rays Hill and Sideling Hill Tunnels. At Pump Station Road, the trail ends. So you have about 8 miles each way. The Turnpike bridges where it crossed Route 30 and Pump Station Road were removed to prevent hikers and bikers to go onto Turnpike owned right-of-way. East of Sideling Hill Tunnel is the site of the Cove Valley Service Plaza. I discovered the abandoned turnpike while staying at the Quality Inn. I shot some video back in the 1990’s. I’ll have to dig it up and put it on YouTube. That view to the West from Sideling Hill is beautiful! My buddy was a charter bus driver back in the 1960’s. and distinctly remembers the back ups preceding the tunnel entrances. Thanks for this article! The information here helped us plan our trip. Our relatively out-of-shape family of 5 (ages 11-54) biked this from Breezewood through to the end of Sideling tunnel (and back!!) in August 2018. We were too wiped out to finish the 1.2 miles to the end of the trail. This was such a unique and unforgettable experience for the entire family. There were points biking between the two tunnels that several of us thought we would pass out from exhaustion, (there were low grade hills that we struggled through) but my word, was it worth it. In hindsight, we’d have brought more water bottles, and given every one a mounted flash light for the tunnels, instead of sharing three. 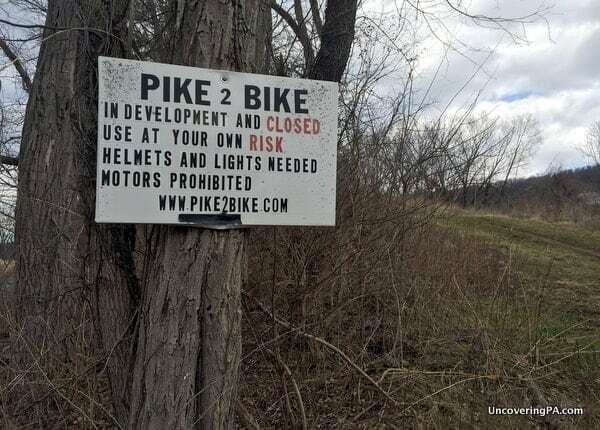 I have been reading much about the bike2pike organization, and my only hope is that they can make it safer for more people to have access to, without taking away some of the raw wilderness. Yes, some stretches of the road are Not biker friendly, but that gave it some of its charm. Despite some of the obscene graffiti, this was an excellent family day trip. And to think we almost did Hershey Park instead. Janet, please realize that the trail you biked was designed as a highway, so those grades up to the tunnels were no problem with autos. Bikes? Yep, I had to walk my bike up the long upgrades. Regarding the roadway, the Pennsylvania Turnpike was paved with 9 inch Portland cement, with joint lines every 72 feet. The pavement was prone to cracking due to the nature of the process the way the highway was paved. In 1955, the 3.8 miles was repaved, the section west of Rays Hill in 1956, and east of Sideling, in 1960. Since the highway closed in 1968, only a short piece was repaved for experimenting with the “singing shoulder.” The tunnels retain their original concrete surface. Mitchell, thanks so much for sharing that tidbit of information. What you shared does seem to match up with the conditions of the various stretches of road we encountered. I was under the impression that it was a flat stretch of road, so I made the comment as a heads up for those who made the same assumption. You are indeed right, though. A hill for a car is not at all the same for someone on a bike. All in all, we took the hills, the potholes, the dripping water in the tunnels and everything in between as part of the whole package. I am so glad our family did it. Thanks again for the additional information. Janet, I discovered that old highway in 1973 and at the time, it had only been closed for 5 years. I did get to drive it several times. When the highway went to SAC, some of the bridges were removed so hikers would not go onto Turnpike property. I have many pictures when the highway was new including the section you biked on, and coauthored two turnpike books with Neal Schorr and we have many pictures in the books. Mitchell, it turns out that your book “The Pennsylvania Turnpike” was sitting on my husband’s book shelf. You were not kidding about the great photos, and I enjoyed reading it from cover to cover. Thanks for sharing your passion. Mitch, I went out and bought your second book. Read it in 24 hours. It read like an adult picture book, packed with information. Very well done. I travel the turnpike quite a bit, between Bedford and King of Prussia, and your books have given me a deeper respect for it. Thanks again for sharing your passion. Janet, we are glad you liked our second book. I just want to make a correction of a photo caption, which was corrected by the bridge engineer on the Turnpike. I don’t have the book in front on me, but there is a picture of the highway on a straight-away showing the highway in terrible condition. We say its east of Blue Mountain Tunnel, but actually MP 118, Brotherton, with Horse Track Road which is the steel girder bridge. This section was rebuilt about 20 years ago, with new overpasses, but still two lanes each way. Enjoy! 10/23/18: I spoke with the PA Game Commission, Huntington office, regarding the bats. They confirm there are hibernating bats, and due to the white nose disease that has decimated bat populations, it is best for the bats if people stay out of the tunnels when the weather gets colder. There’s nothing for bats to eat in the winter, so if the bats are disturbed and fly away, they burn up too much of their energy so they can’t safely hibernate the rest of the year. That said, I suspect the bats are hibernating in the ventilation shafts above the main tunnels. Hence, if you feel you must go through the tunnels during colder months, it is best to minimize noise and of course, don’t shine bright lights at all, and no lights upward through the ventilation holes and/or holes for the light fixtures in the ceiling. I’m thinking the best way to go through the tunnels during the colder months, if one feels they absolutely have to do so, is to walk through with only a flashlight bright enough to be able to safely see. Riding a bike can make more noise than walking, so push bikes through the tunnels, and avoid talking. As someone said about ATV’s, it is often the ones not following rules that cause problems. So if we can spread the word to ideally stay out of the tunnels during colder months, but be as quiet as possible with the minimum amount of light possible if passing through the tunnels during colder months, hopefully we can help the bat population. When I was a kid one of the vacations we went on one road we traveled was the Blue Ridge Parkway and the other was the Pennsylvania Turnpike. Both back then were the future of highway travel. How things have changed! Somewhere in my archives I have a book about the PA Turnpike. Maybe some day I’ll get to the bottom of it and find it! Outstanding post! Pictures, detailed directions, can’t wait to take the bike out there! Thank you.